One of the most popular Kids channels in India, Wow Kidz is now available on YuppTV. 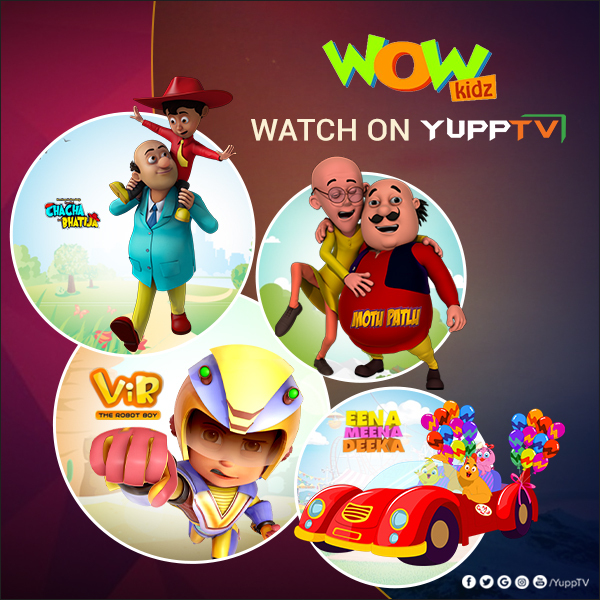 With the Launch of Wow Kidz on 27th April 2018, YuppTV unveiled a whole new genus of entertainment in its archive as this is the first time Kids content is made available on YuppTV platform. Airing Cartoon Shows like Motu Patlu, Chacha Bhatija, Eena Meena Deeka, Vir the Robot Boy, etc., which are hugely popular among Kids in India, Wow Kidz plans to extend its reach to the Indian audience living abroad. With the help of YuppTV, which is highly popular among all the Indian communities in various countries like US, Australia, Canada, UK, Singapore, Malaysia, etc. Wow Kidz now caters to a global audience. Targeting Kids from age groups below 12, Wow Kidz is doing a pretty decent job with its content in India. The channel airs entertaining cartoon shows with lots of humor and ingrained moral and life lessons in Indian languages Hindi, Tamil, and Telugu. One of the most popular shows on this channel- Motu Patlu is about two friends who always get into trouble and get out of them by sheer luck. The show is highly popular for its plots, the hilarious dialogues and the morals in the end. Another show “Vir: The Robot Boy” which is a story about a Robot who helps people and fights against a mad scientist named Mad Max with the help of his friends Chulbul, the pet donkey, Imli and Gintu, and his magical Ginn, creating humor along the way. Many shows like Eena Meena Deeka, Chacha Bhatija, Bablu Dablu, Gattu the Power Champ, etc., are also highly popular among kids of all ages in India. This is a giant leap for YuppTV that has always been catering to the audience of higher age groups. By extending its services to the adorable new generation YuppTV’s inventory now serves populace of all the age groups.